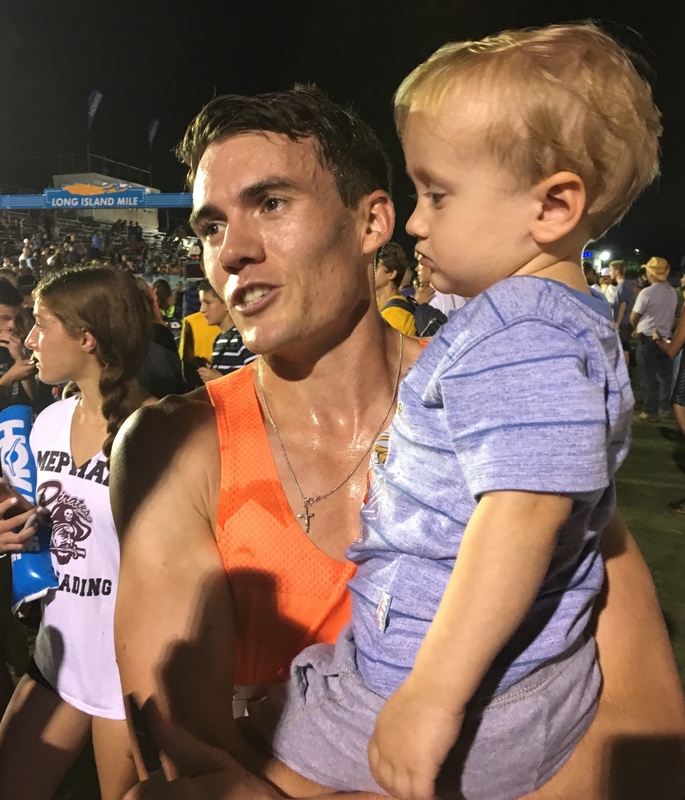 BAY SHORE, N.Y. (05-Sep) — On a warm and humid evening here at Bay Shore Senior High School, Chris O’Hare andShannon Osika prevailed over competitive fields at the fourth annual Hoka One One Long Island Mile. O’Hare, a Scotsman who competed for the University of Tulsa during his NCAA career, successfully defended his title in 3:55.53. Osika, who competed for the University of Michigan and still lives and trains in Ann Arbor, got her first win here in 4:29.91. Both athletes won $3000 in prize money. Fifteen athletes took to the track for the elite men’s race which began at 8:52 p.m. Ford Palmer, a former high school football player who competes for the Hoka New Jersey-New York Track Club, was the designated pacemaker. Moving swiftly from the starter’s gun, Palmer quickly strung out the field, hitting the first quarter in 58.8 seconds. He was followed by Cristian Soratos, O’Hare, and Canada’s Charles Philibert-Thiboutot. But the pace sagged in the second quarter, and the halfway point was reached in only 1:58.6. At that point, Philibert-Thiboutot realized that he needed to change his strategy. Instead of waiting for the final 200 meters to sprint, he would launch earlier and try to jump the field. Palmer made it through three-quarters in 2:59.3 before retiring. Philibert-Thiboutot immediately put in a surge (editor’s note: picking up a $500 prime for leading at the bell), and O’Hare responded.